He has won 19(!) tour events since the first Racketlon World Tour was launched in January 2003, which is almost five times as many as anybody else (see all time listing). He won three straight world championships 2002-2004 and is going for a fourth title this year in Belgium. 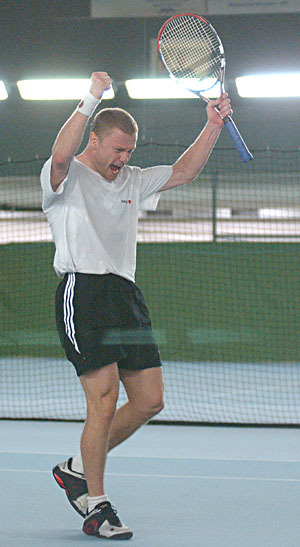 He was the number 1 on the racketlon world ranking for 36(!) straight months (13 November 2002 - 15 October 2005) and when he fell down from the number 1 position it took him just a couple of weeks to recover and start a new series of straight months as number 1 (6 November 2005 - presently). His physical strength is obvious to anyone that has seen his retrieving on the squash court but most observers agree that it is probably his mind - his ability to focus on every single point and never give up - more than anything else that makes him the world number 1. His name is Magnus Eliasson and if you want to find out more about exactly how he does it check out his message below. A classic photo of Magnus Eliasson straight after winning his second world championship in Gothenburg 2003. As some of you might know I am running my own company working to help people develop mentally to be able to reach the goals they set in life, in relationships, at work, in their hobbies and in sports. I also work with people that want to change their interpretation of the world around them in order to function more constructively and feel better about themselves. I am writing to you in order to make you aware of that if you feel that you want to increase your mental ability to get closer to the goals you set in life and in Racketlon all you have to do is log on to my homepage www.mftsverige.com and contact me under the headline "contact us" at the top of the page. There you will find all the information you need in order to make up your mind if mental fulfilment training (MFT) is something for you. It might be the boost your Racketlon career or life need?! Do not hesitate to contact MFT Sweden! Hope to hear from you. All my best.